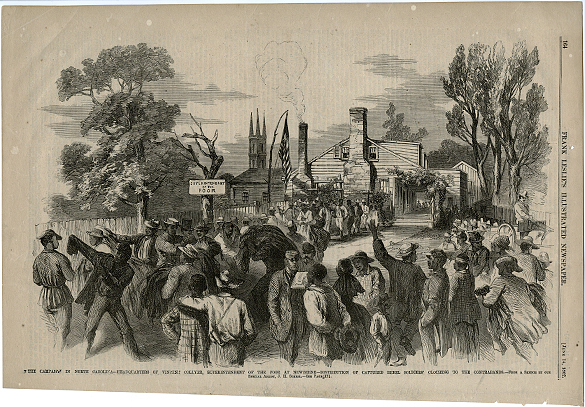 Item: “THE CAMPAIGN IN NORTH CAROLINA—HEADQUARTERS OF VINCENT COLLYER, SUPERINTENDENT OF THE POOR AT NEWBERNE-—DISTRIBUTION OF CAPTURED REBEL SOLDIERS’ CLOTHING TO THE CONTRABANDS.—From a Sketch by our Special Artist, J. H. Schell.—See Page 171.” Frank Leslie’s Illustrated Newspaper, June 14, 1862, p. 164.
provocative to all the white spectators. Item Citation: North Carolina Counties Collection, Flat Box 02, folder P0001/0311. North Carolina Collection, Wilson Library, University of North Carolina at Chapel Hill. This entry was posted in North Carolina Collection and tagged clothing, Frank Leslie's Illustrated Newspaper, freedmen, Vincent Colyer. Bookmark the permalink.